I wish I had more time these days to write articles for this awesome little newspaper, but I made the mistake of taking a new job near the end of my career in order to boost my soon-to-be future retirement income. Don’t ever do that. BIG mistake. But in only 3 years, 9 months, and 23 days I get to retire, grab hold of my wife, throw everything in the back of our truck (the furniture, not the wife, just want to be clear on that), and move from the flatlands of southern Maine up to our beloved Rangeley Lakes Region. At which time I’ll be writing so much you’ll wish I was back at my old job. So anyway, I said all that in order to say this. 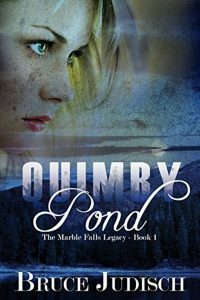 I read an incredible little romance/mystery/thriller book last winter, called “Quimby Pond”, by Bruce Judisch. And not only was it a “page turner/can’t put it down” type of book, but the whole thing is set in Rangeley Maine, which obviously made me love it even more. The book, as well as the sequels, only exist today because somebody local was rummaging through their attic and found a 120 year old copy of the “Rangeley Lakes” newspaper (August 20, 1896) and showed it to their friend Bruce Judisch, who just also happened to be an author. 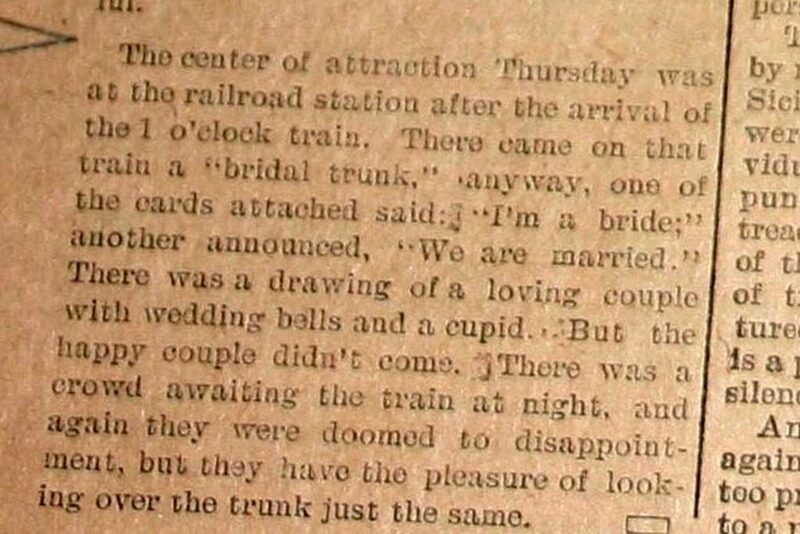 An article in that newspaper about a mysterious bridal trunk arriving at the local train station then inspired Bruce to write his books. I just think it’s really cool to be reading a book that was inspired by a Rangeley newspaper from 1896 found in a local attic, as well as being able to know and picture the exact places in town that the author is talking about. And it was such a great read that I vowed to write an article about it. So I reached out to the author, asked him a bunch of questions, and fully intended to get the results of that organized into a story and off to Stephanie for publication. But I didn’t. In fact, so much time has gone by since I vowed to write that article that a young couple could have 1) decided they want to have a child and 2) could have actually given birth to that child by now. That’s all due to the job I was referencing above. As I stated in my earlier FB message, Quimby Pond would have been one of my favorite books ever, even if it hadn’t been set in my favorite town ever. Why write a book with the setting of Rangeley Maine? I believe you’re from San Antonio? Yes, I am from San Antonio, but I have friends in great places — like Rangeley. One of those friends shared with me a newspaper discovered in his great-aunt’s attic. It was a copy of the Rangeley Lakes from August 20th, 1896, and it carried a fascinating article on an inner page. I summarize the article on the cover of Quimby Pond, but here’s a photo from the newspaper itself. How could any self-respecting fiction writer read something like this, and not write a mystery story? What can you tell me about your trip here for research, where did you go, who did you meet and talk to? Did you take a trip here first and then decide to write a book, or did you decide to write about Rangeley and then visit. I visited Rangeley first in early May (not recommended) of 2015 to research Quimby Pond, and then again in August of last year where I supported the library’s annual fund-raising gala and do more research for the sequel I’m writing now. I’ve included the folks who made the story possible in the Acknowledgments page, but to name a few, I’m especially indebted to Belinda Mansfield as my primary local point of contact, who the public library referred me to when I requested help with research; Jarod Austin of the Rangeley PD took time with me to answer law-enforcement-related questions; and Earle Albert of North Star EMS, who was great at both answering medical/medical-transport questions and even suggesting some scenario elements that fit beautifully into the story. There are others who I hope will forgive me for not listing here, but they do appear in the book. Why did you call the town in the book Marble Falls instead of Rangeley? As far as the name “Marble Falls” goes, I named it after John Marble, who is a prominent figure in Rangeley’s 19th-century past (the Marble Train Station was named after him and he was one of the founders of the old Rangeley Lake House Hotel), and Angel and/or Small Falls (take your pick), not all that far from you. The names go together well. The reason I changed the name at all is a little more involved. I actually had retained Rangeley as the name of the town all the way until the very last edit, when my editor suggested I fictionalize it. Initially, I rebelled at the idea, so entrenched was I in the town and the region. However, I discovered she was right. There are too many necessary fictional elements of the story that would not fit the actual setting – and violating the real Rangeley by inserting non-existent places into it would surely annoy some folks who are familiar with the town, kind of a credibility thing. You can get away with hiding fictional places in large settings like New York or Chicago, but not a small town. So, I renamed some of the streets and businesses in town (although I credit them in the Author’s Notes at the end). When I do take the story out of town, I revert to real names, like Quimby Pond and Farmington. Why did you pick Quimby Pond for the setting? I selected Quimby Pond as the focus, since those friends I referred to earlier have a cabin on the pond. Can you talk more about the historical basis for your book, what parts are based in the actual history of the region, ie the trunk, the smuggling? On the historical part, I did a lot of research (some in conjunction with some contacts I made in the History Department at UMaine in Orono), but then fictionalized some of it to fit the story of the trunk. (Trying to avoid a spoiler here regarding the smuggling aspect for those who have not yet read the book). The trunk itself is introduced in the historical storyline of Part 2 of “The Marble Falls Legacy” and will be completed in Part 3. The characters, Corky Williams, Margie, Gwen Kelley, Brent Newcomb, any insights on them or who they were modeled after? On the characters, no, they aren’t patterned after anyone in particular. I just made them up and love them dearly. The primary attachment is to Gwen, who is named after my 14th grandchild. If I were 40 years younger, single, and had not already met my lovely wife, I would so date her. Corky Williams was probably the most fun to write, followed closely by Skeeter. Can I ask who the friend is and who the great aunt was and where she lived, and where the old newspaper paper was found? Fascinating to see an actual newspaper from 122 years ago! Regarding my friends on Quimby Pond who showed me the article, it was their great-aunt, who I believe lived in either Strong or Phillips – someplace close by. I wrote them anonymously into the story as the lady who lived on Needham Lane and reported seeing Turk Sawyer’s car to the police. Can you tell me more about Belinda Mansfield, why the library recommended her, and how she was helpful? When I was researching QP, I contacted the library asking if there might be someone who could help me, and Janet Wilson (the director) suggested Belinda, who did some part-time volunteer work there. She was my primary point of contact in seeking out other experts (historical, law enforcement, emergency medical, etc. ), as well as general questions about the town. What can you tell me about your upcoming book? The tease at the end of Quimby Pond got me wondering! I’m glad the tease got you to wondering. That’s what teases are for. I’m over 96,000 words into the sequel now, and hope to be able to release it this summer. It carries a dual storyline – contemporary and historical. The contemporary story continues Gwen’s quest to settle her late-father’s estate, which is hung up in probate by a curious twist that puts her once again into danger. 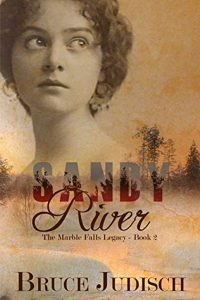 The historical story is about her distant grandmother, Irma Louise Kelly, whose family lives in Boston, but who becomes unexpectedly enamored with Marble Falls through befriending Mary Jane Toothaker – a name some will recognize as a genuine historical figure in Rangeley. That’s all I’m going to say about that. You’ll just have to wait for the sequel to come out. Anyway, get a copy of Quimby Pond and read it. Then get a copy of Sandy River and read that. And when Part 3 comes out, whatever it’s going to be called, get a copy of that and read it. If you live here, or even just WISH you lived here, I guarantee you’ll love it.